Someone’s up in the middle of the night. :) This is a lovely little flower. You and Steve are really whetting my already ravenous appetite for our spring flower returnees. I’ll be looking forward to the continuance of this series. Actually, someone just got smart and figured out how to schedule posts to suit the schedules of early risers on the east coast. I was delighted to find these gems. I’ve seen them in the wild once before, along a creek in the hill country, but they’re not present in my immediate area, so this was special. Maybe one spring you can drive down here to see and photograph these wildflowers for yourself. It sure would be a nice trip. Maybe in the next year or two. Life’s short; best not wait too long. Here’s to 2020. That Herrick (and you) knew what you were talking about. Oh it’s gorgeous! Beautifully presented too, as I’m thinking the blooms are quite small. Not until there’s some autumn rains, will I be likely to find native blooms, so your spring posts will be a delight. They are small: about an inch in diameter, or a bit more. The petals catch the light beautifully; they do bear a vague resemblance to frosted glass, or sugar-coated French mints. I’m not really fond of the term ‘super bloom’ (although I can’t pinpoint a reason), but this is one of those special years — it’s really a little overwhelming. The comment by Aldo Leopold reminds me that the world needs more Aldo Leopolds. As for the Texas Baby Blue Eyes I suspect that Aldo may have marked this as one of the birthdays he heeded. I came late to A Sand County Almanac and Leopold’s other writings, but they are wonderful. There’s a tendency during Texas’s spring to focus on bluebonnets and Indian paintbrush, and rightly so. They can be spectacular, spread across the fields. But spring holds other delights, even if they’re not quite so noticeable. I don’t think I’ve ever seen frosted petals up close before, and certainly not as clearly as in your outstanding photos. Thank you for the introduction to this delightful flower! I’m happy to make the introduction, and I’m so glad you enjoyed the photos. I find buds especially appealing, and I think it’s fun to see buds and fully-blooming flowers together: rather like a family photo showing multiple generations. Such a lovely color. I like blue flowers and my hyacinth always looks about half-dead. I wonder if this would grow here. I’m fairly sure the answer is yes, although they’re a cool season plant by nature, and all the species across the country seem to have about a three-month bloom period. Here’s an article that offers some clues. 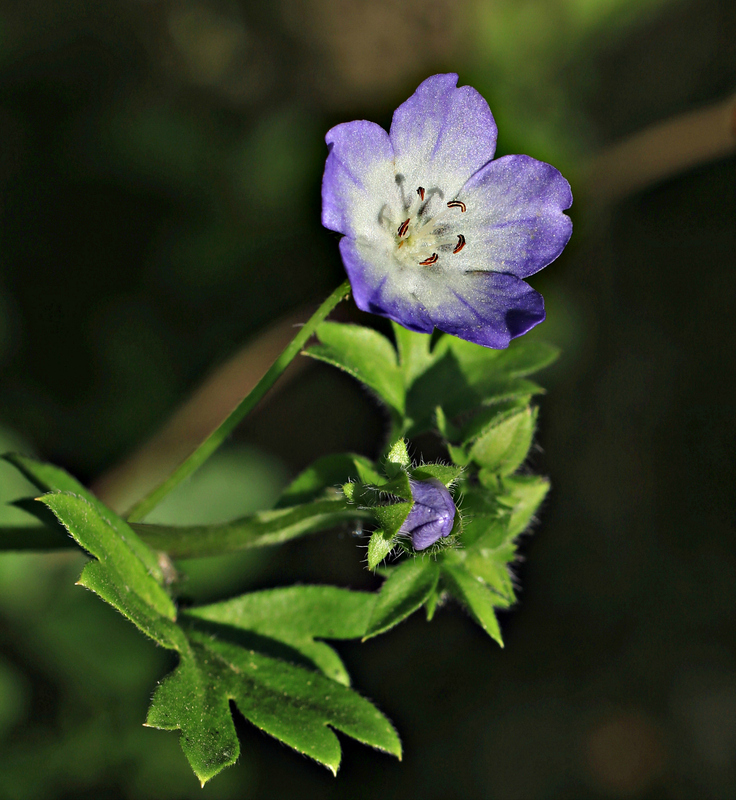 You might look for some seeds of Nemophila menziesii. It’s native to the west coast, but seems to be popular among gardeners. You are a treasure trove of information, Linda. Thanks! You may or may not be surprised to hear that I saw my first baby blue eyes for this year in January, and not just buds but open flowers. And it still surprises me when botanists move a species not just to a different genus but to a different family. It’s getting increasingly difficult to say whether a blooming flower is a holdover from last season or a harbinger of the next. On the other hand, baby blue eyes are a cool weather flower, so a damp, milder winter might suit them. As for those changes in genus or family, I do my best to keep up, but sometimes I learn about them quite by accident. After I stumbled across the change in family for this plant, I did some checking around and found even reputable sites that haven’t yet updated their information. That first shot is stunning. Such beautiful DOF. (I suppose it has to be a dedicated macro lens?). Yes, I have a Canon 100mm lens. I really like it, although I still haven’t learned how to cope with strong wind when I’m using it. I’ve tried automatic focusing, but it’s a little slow; I actually can do better manually. There wasn’t any wind when I took this photo — and I was most grateful. I had the Canon 100mm as my very first lens when I bought a DSLR in Dec 2010 (and ended up trading it in) – but soon found the wind in the Botanic Gardens made flower photography very difficult. It’s a lovely lens. One of my biggest problems is underexposed photos because of a high shutter speed with inadequate adjustments in aperture and/or ISO. It wasn’t a problem in the past, but when I thought about it, I realized I never used to go out if it was “too” windy, or cloudy, or wet. If you start with nearly perfect conditions, it helps — but imperfect conditions do aid in skills development. By the way, I used your trick with the spot metering to shoot through a fence recently, and sent a little gratitude your way. Good to hear my tip worked for you, Linda. If the subject is the right distance behind the fence, it seems like a little miracle when the fence wire disappears in the resulting image. Plant birthdays – perfect phrase. Gorgeous picture of bud and great contrast/design posed by the last one. How lucky you are not to have overlooked the invitation to the party. Do you suppose their parties all are BYOB — Bring Your Own Bloom? Leopold’s suggestion of plant birthdays really tickled me: as did his mention of hay fever. I do hope we get some rain this weekend. The flowers could use it, and we need to get this pollen out of the air. Excellent photos. I’m with GP Cox, I like blue flowers, especially on hot days. Now you have me thinking about when our blue flowers bloom. It seems to me that most of them arrive in early spring, and then fade away as temperatures rise. That might not be so, but I’ve come to associate yellow flowers with summer. A little cool-blue would be good in August, that’s for sure. These are lovely, Linda. Still too early for us to see wildflowers bloom, but soon I hope! Love the pretty color. I just looked at your forecast, and was reminded again how far north you are. It’s hard to imagine you’re still below freezing at night, but change will come. After all — it’s almost April. If things don’t begin greening up until May, it helps to explain why you try to make the most of your lake time in the summer! Great photos. I love looking at everyone’s wildflowers. I thought the name was familiar, as I tried to grow them once. They didn’t like it here. The birthday reference made me think. My birthday is in March and in Texas it is the beginning of spring and a exciting time with all the wildflowers and gardens blooming. Up north my birthday was pretty gloomy during that transition between winter and spring. Glad to be here and especially with our gorgeous weather these last few days. It has been extraordinarily beautiful, hasn’t it? We endured so much fog, rain, and general gloom for so long, everyone seems pleased beyond words to have some sunshine. When I lived in Iowa, March was mud season, and that was about it. There were sad piles of dirt-covered melting snow, but they didn’t do much to cheer us up. Wildflowers are much better. You really captured their charm and beauty perfectly in that last shot! Thanks, Tina. ‘Charming’ is just the right word for them. I couldn’t get any decent photos of the whole colony, since they were growing mostly beyond a fenceline and in dappled sunlight, but there were a few that had come out into the the ditch, and they were most cooperative! For a few years, a few years ago, I managed a couple of the gardens at Zilker Botanical, here in Austin. I recall one spring in particular, not in my garden but another part, the baby blue eyes were absolutely luscious. The grew in a woodland area, so there were trees with this carpet of that particular blue. It was so lovely. What interesting work. I swear, sometime I’m going to take a week and visit all these places in Austin that sound out of this world. When I was spending time in Austin on a regular basis, back in the 80’s, I wasn’t at all interested in plants, so Zilker Botanical, the Wildflower Center, and such were completely off my radar. One of these days. I usually don’t have problems with the pollen, but this year’s been an exception. I suppose it makes sense that when conditions favor more flowers, they also favor more pollen. I’m ready for that part of spring to be over — although I’m sure the bees, butterflies, and other insects that are out and about appreciate the pollen and nectar in a way we never will. A underrated wildflower! I love these. For some reason, the word ‘self-effacing’ comes to mind for these. They’re so pretty — do you see them in your area? I noticed that the USDA map didn’t show them in Fayette County, but they most assuredly were there. That first image of the bud is really outstanding!! The lavender plays so nicely against the greens. Very cool quote by Aldo. Have to laugh over the line “No man can heed all of these anniversaries; no man can ignore all of them… ” Spoken of plants I know, but which are a lot more forgiving than she whose husband ignores hers. Ah, yes. More than a few humorous (and not so humorous) bits have been written about those forgotten anniversaries. I do love the color of the plant. 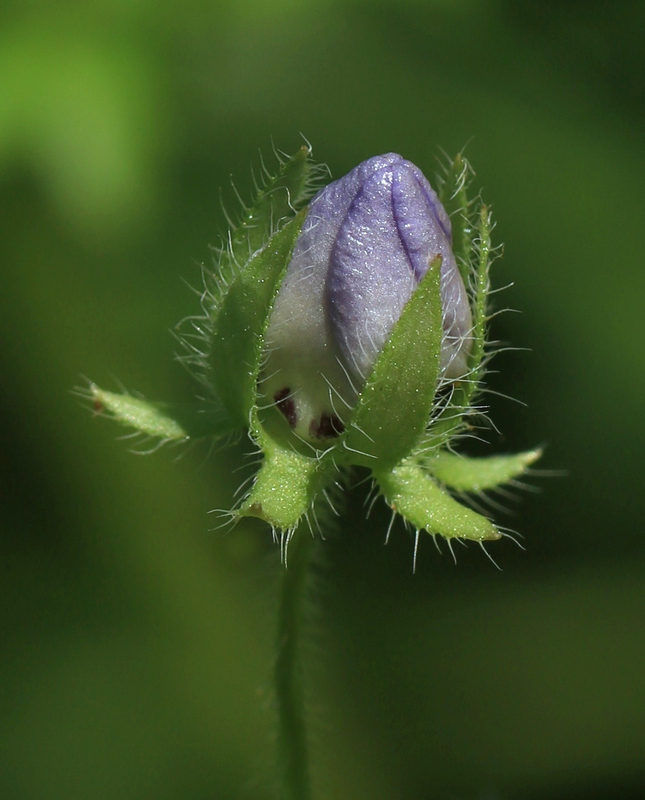 It occurred to me that the lavender portion (and especially the bud) is quite close to the color of Janthina janthina. It’s fun to have a little land-and-sea connection to enjoy. That is funny as when looking at the bud a vision of the janthina shell did come to mind even with the inherent swirl of the closed up bud. While I am sure the color palette of sea and land is infinite, still it is nice to witness similarities in color and form. It is fun, isn’t it? I like to call them ‘nature’s analogies.’ I think it’s highly unlikely Nature says, “I really like that color and form… I think I’ll use it again.” On the other hand, who’s to say? Thank you, Dina. It certainly charmed me — and continues to do so. Baby Blue Eyes is another plant that I adore. Blue is my favorite color so it is quite pleasing to me. I see them along road ditches or at least I used to see them there. I think I might have seen a few growing in the suburbs. It is such a dainty little bloomer. I like your photo very much. Knowing that their season is so short makes them even more precious, and when they’re as beautifully colored as these, it’s hard not to wish they’d linger just a little longer. At least I have some photos now — I’m glad you enjoyed them. Beautiful photos! The one of the bud is outstanding! Thank you, Terry. The conditions were perfect on that day: down in a valley, out of the wind, along a road with no traffic at all. It was wooded, too, which is unusual in that area, but the shade and the stream were a perfect setting for these flowers. Happy Birthday, Baby Blue eyes. Baby Blue thanks you for your good wishes! I love the idea – and that’s a sweet one! I’m one of those that will greet just about anything in nature, so the thought of extending birthday wishes to a plant seems perfectly reasonable to me.